Noele 4 Jazz (N4J) is a community based jazz dance school operating on the Cape Flats. On the 11th of May N4J in conjunction with Bush Radio 89.5 fm and West End will be hosting a fundraiser and part of the proceeds will go to the Saartjie Baartman centre for abused women and children. 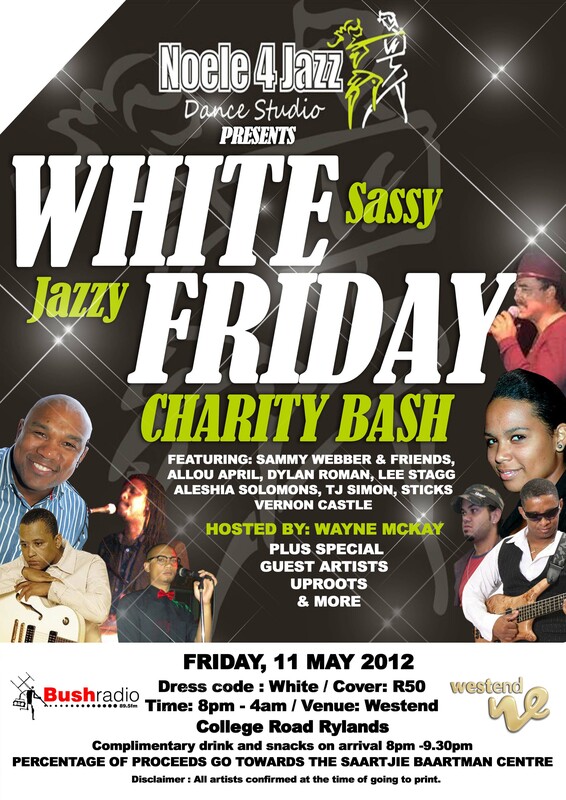 This White Sassy Jazzy fundraiser will feature artists such as Sammy Webber, Allou April, TJ Simon, Dylan Roman, Alicia Solomons, Wayne McKay and many more. Entry is R50 per person at the door drinks and snacks on arrival. Pre book your tickets by calling or sending a sms to 082 557 5178.